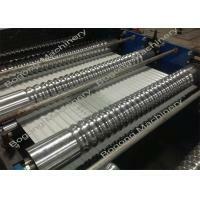 Home Companies Xiamen Bogong I & E Co., Ltd.
Rollers manufactured from 45# steel, CNC lathes, hard Chrome Coated, fine polished. As one of the most important Aluminum-Zinc Prepainted Steel Sheet Corrugated Roof Roll Forming machine, like IBR sheet roll forming machine, Corrugated sheet roll forming machine makes metal roofing and siding panels from the materials of 0.3-0.8mm thickness and 914-1250mm widths. Generally, almost all the Aluminum-Zinc Prepainted Steel Sheet Corrugated Roof Roll Forming machine can produce 750/825/1050 effective widths, 75mm wave distance and 18mm wave height from corresponding raw steel sheet width. Most important, one corrugated sheet roll forming machine can make all the above mentioned sheets. One Aluminum-Zinc Prepainted Steel Sheet Corrugated Roof Roll Forming machine mainly includes: one set manual decoiler, roll forming machine with feeding guider, transmission system, hydraulic system, control system, a hydraulic cutter, an oil pump and manual runout tables as well. Aluminum-Zinc Prepainted Steel Sheet Corrugated Roof Roll Forming machine is a very necessary roll forming equipment that produces corrugated roofing and siding panels for industrial, agricultural and individual buildings. First of all, corrugated metal roofing and siding panels are made of various metals and alloys steel, such as copper, aluminum, zinc alloy, stainless steel, prepainted steel, galvanized steel and Alu-zinc steel etc. The Aluminum-Zinc Prepainted Steel Sheet Corrugated Roof Roll Forming machine is popular, because many users choose prepainted steel, galvanized steel and Alu-zinc steelfor buidling material.Why? The answer is simple! Compared to the traditional clay tiles, stone or brick cladding, the metal roofing and siding panels are always lighter, more beautiful, more safe, and most importantly, more durable.